It's time for an all new Sparkle Creations Rubber Stamps Challenge! Each week we will post an all new challenge at this time (9 PM PST on Mondays). For all the details, please visit the SCRS blog. 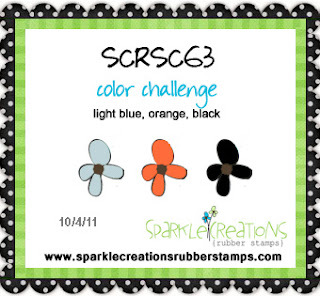 This week is a color challenge -- Light Blue, Orange and Black. This is the first challenge for October, so we are welcoming a new Guest Designer... Amy Tsuruta! Welcome, Amy! 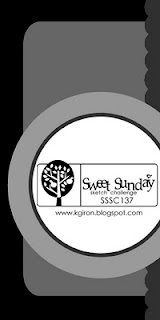 I used Mummy Oliver on my card today and used Karen's Sweet Sunday Sketch #137 for my layout (condensed to a standard A2 card). Accessories: Standard Circle Nestabilities (Spellbinders), Drippy Goo border punch (Martha Stewart), Markers (Copic), Black Candy Dots (Pebbles), Foam tape, Thread, Sewing machine. Oh how cute Stephanie! That little mummy is darling and your stitching looks awesome! Fabulous! What a wonderful Halloween card! Adorable! Love the stitching and papers you used! this is so fun. super card, Steph!